SeaNav app, now with AR, GoFree, and Pebble! SeaNav and GoFree both support Apple’s Bonjour discovery protocol, which meant that all I had to do to start was put the iPad on the boat’s GoFree WiFi network and enable GoFree in SeaNav. SeaNav discovered the NSS8’s data without having to specify an IP address — including its custom descriptive name “NSS-low-helm” — and the next time I went aboard and turned things on “it just worked”. This is particularly relevant because NMEA’s coming OneNet standard will include both Bonjour and the similar Simple Service Discovery Protocol (SSDP). So the reliable and nearly automatic integration of SeaNav and the NSS8 is hopefully coming to many apps and marine electronics systems. 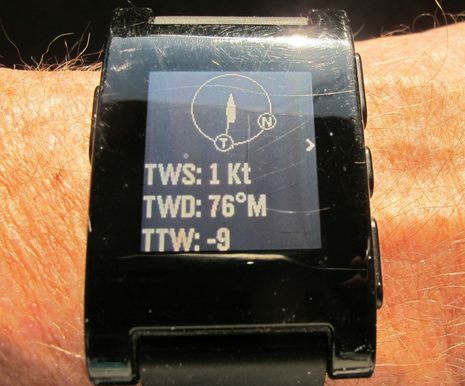 The Pebble connection was just as smooth and easy (most of the time), and given the predicted explosion of smartwatches, may be a similar sign of future boating. The first time you enable the feature in SeaNav, you’re asked to download their Pebble SeaNav app and install it using the Pebble Smartwatch app most owners will already have installed on their iPhone or iPad. 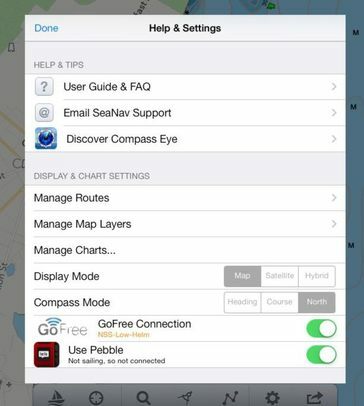 Once that’s done, every time you put SeaNav in ‘Sailing’ mode — which is akin to activating a route or go-to waypoint — the Pebble starts showing a family of screens that vary according to what extra data the app is getting from GoFree or from its sister Web AIS app Boat Beacon. Unfortunately, a recent Pebble update intended in part to improve iOS integration actually messed it up, but I’m sure that will be fixed soon. 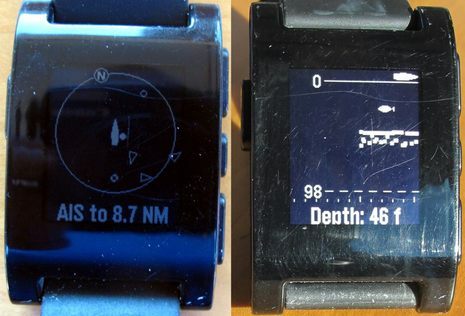 There’s more on the Pebble connection below, but let’s have a look at what SeaNav can do by itself first. 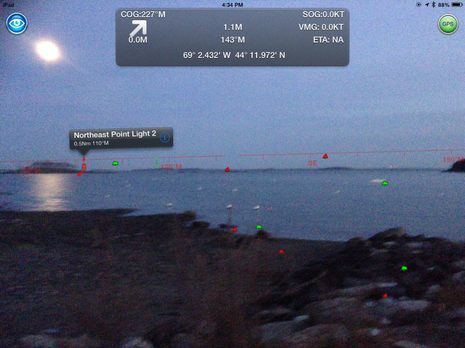 At any rate, SeaNav is now an able charting app for U.S. waters that offers an interesting augmented reality feature and can also integrate with the Boat Beacon Web AIS app that first alerted me to Pocket Mariner’s innovative ways. But I want to finish with some more on what SeaNav and the Pebble can do. 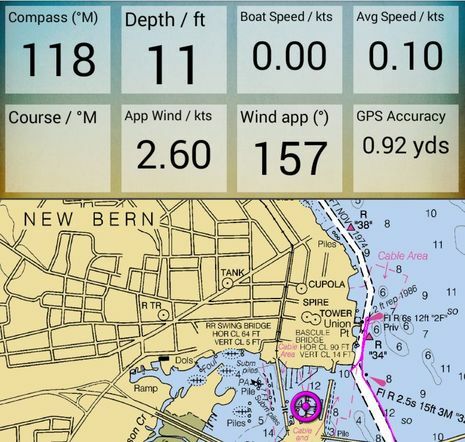 Yes, that’s an auto-scaled AIS target plot on the watch face at left, and the data can come to SeaNav either from the GoFree system or from BoatBeacon, which can be getting it online via cellular and/or from your boat’s conventional AIS receiver or transponder via WiFi and a TCP connection (be it GoFree or many others). And an AIS CPA (Closest Point of Approach) warning will set off the Pebble’s vibration feature (a silent but effective alarm that is one reason I wear the Pebble constantly). 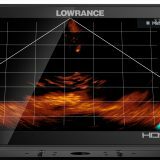 The little fishfinder face — which could be very useful to cruisers, too — does require a GoFree connection, but there are also various navigation screens that only need the SeaNav app to work. 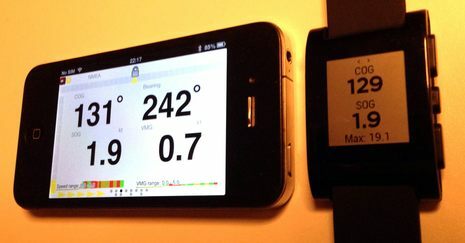 The iRegatta sail racing app also offers a Pebble extension now, and note that they’re promising an Android version soon. I’m sure we’ll be seeing more smartwatch apps like these. Are you interested? Are the scratches in the watch as deep as they look? Any chance you can choose which sailboat sail you are using (or otherwise select a polar), and get the sailboats target speed for the wind conditions? Dan, SeaNav doesn’t do target speeds but I suppose it could pass them along if the GoFree source was a B&G MFD that works with that sort of data. It’s also quite possible for iRegatta or another performance app to push that info to the Pebble. In regular use I’ve never noticed those scratches on my Pebble but they sure show up with sharp sunlight and a good macro photo. One may even qualify as a crack though I shower regularly with the watch on and also don’t hesitate to plunge it into a dish pan or similar. I also wanted to be clear about the possible differences between Web AIS and the real AIS transmitted directly from boat to boat over VHF, particularly in regard to Boat Beacon, which will try to do collision avoidance with Web AIS, and SeaNav, which can integrate with Boat Beacon. Internet AIS only includes the vessels that are being picked up by volunteer shore stations over VHF and sent to the various data collectors like MarineTraffic that Pocket Mariner uses for sources. In some places like parts of Europe and the UK the coverage is quite good, but it’s quite spotty along the U.S. coasts. It may also fail to receive weaker Class B signals even though the Class B vessel is near you and nearby Class A vessels are showing up fine via the Internet. A lot of boaters are confused about this. And here I had thought a Pebble was a useless gizmo. I’ll be getting one now, as this looks very handy. Who will be the first Pebble/GoFree developer to beat the Garmin Aquatix in full? Unless Garmin rushes out with updates, the unstoppable cycle of the independent developer + open platform will necessarily outdo the closed-platform player. I don’t think it’s as simple as that, Xavier. Apple’s iOS is arguably not a true open platform, for instance; Apple sets tight rules, approves all apps, and gets 30% off the top. I’m not saying that’s a bad thing. In fact, the result seems to be an easy, reliable hardware/app ecology that keeps a lot of users very happy. 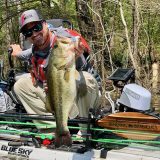 Garmin has lots of devoted customers for similar reasons. I’ve been testing the VIRB action cameras, for instance, and the easy interface blows GoPro away, I think. Plus remote control of the camera with the quatix watch couldn’t be simpler. It’s great that Pebble is getting apps to control phone cams and eventually one to control GoPro cameras but that will have to involve a phone or tablet as intermediary between Bluetooth and WiFi. Android seems more like a true open platform but while I still like my Nexus phone, I always caution people who are thinking about buying Android. It does things iOS won’t but it also screws up in ways iOS rarely does. I’ve also noticed recently that there seem to be few or no Android marine apps that can receive NMEA data over WiFi from GoFree or the various other providers. Am I missing something, and, if not, is there something in Android that makes this harder? Very cool to see this working. Note this was all enabled by open standards and interfaces made available by Navico (GoFree), NMEA (0183), Pebble (Pebble SDK), and IETF. 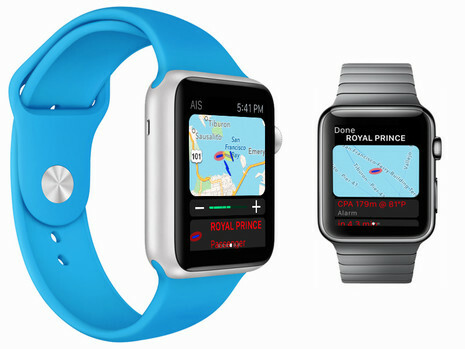 What you have on your wrist is an example of the Internet of Floating Things. Perhaps it won’t be long before we can view our boat data on google glasses. I think your mention of the differences between “web AIS” and real, VHF-based AIS is very important. I am seeing way too many people thinking that a $5 app will replace an AIS receiver for actual navigation without understanding the limitations. One must read pretty deep into the App descriptions/FAQs for the developers to fess up this. ON the other hand, it is great to see more and more navigation apps able to accept data from outside sources via wifi or BT. 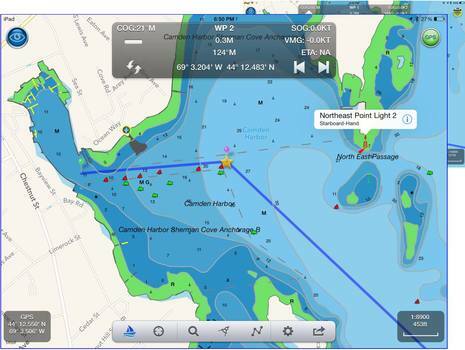 A simple transmitter (like Navico GoFree or some of the Digital Yacht devices) connected to existing ships equipment can provide better data to many of these apps than you can typically wean from an internal GPS on a mobile device. And it does wonders to conserve battery power on the mobile device. “Internet of Floating Things” — well said! Actually I’m not sure any developer aside from TripCon is even using GoFree N2K data, probably because there isn’t a standard way to encapsulate it. 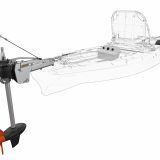 Navico is being very generous about translating native N2K info into 0183 and sending it out in what has apparently become a de facto standard. I think a lot of apps like iNavX can use GoFree partly because they can then use other TCP sources of 0183. Hopefully the OneNet standard will make it easier for app developers to use N2K, perhaps including via modified GoFree. Instantly synchronize waypoint locations, favorite fishing spots and route plans between the Raymarine e and c Series multifunction display and the Navionics Mobile app. Plan your next voyage right on your Apple iPhone or iPad and then wirelessly sync your route plans using the e and c Series built in Wi-Fi. I am assuming that once the data is on the Raymarine MFD it can then send the data over Raymarine’s version of NMEA 2000 to other MFD’s on the network. Thanks, David! You’re not only right about the Navionics/Raymarine Plotter Sync integration but it was way ahead of the pack, on the scene even before any MFD systems had WiFi built in. But I’m not sure it’s as smooth as what Garmin came up with. I recall trying it when the first e-7 came out and thinking it a bit under cooked. However, I should try it again. The pebble does scratch easily and the reason is that they should have used corning’s Gorilla glass (or the even more expensive corning sapphire that high $ watches use) but didn’t because they wanted to keep the cost of the unit down. but I’m not sure what I’d do if I were buying a Pebble today. I really like how comfortable the original model is and the only time I notice the scratches is when I look at this entry!